This is a highly stylized illustration of a Great Crested Grebe. 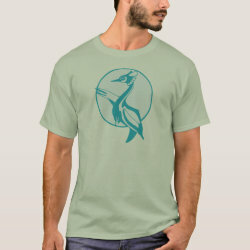 The bird is featured with one wing outstretched and encircled in a light blue outline. This stylish design has a primitive feel and is a great gift idea for anyone that loves these bold and charismatic water birds.